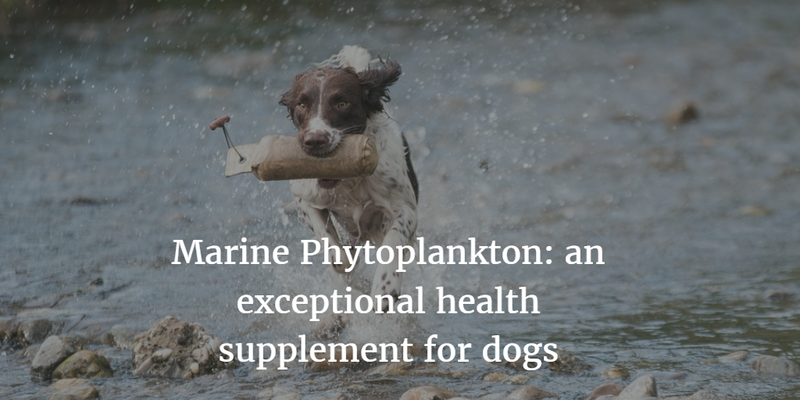 Just as marine phytoplankton powder offers extraordinary health benefits when ingested by humans, so it can for dogs. More and more pet owners are realising that this humble single-celled plant can make a tremendous difference to their dog’s wellbeing, and especially when battling certain serious health conditions. Interestingly, dog owners have been the pioneers in some ways, contacting us more frequently in the early days than humans about the possibilities of this miraculous green powder. We believe this makes it a unique health tonic for pets, especially those with absorbency issues. Is Marine Phytoplankton Good for Dogs? We believe this simple marine organism is the healthiest broad spectrum green supplement for any pet, and we have seen it working on profound levels with our own animals. Mix in a gram or two with their food, and you’ll see immense benefits to their skin and fur, the shine in their eyes, and even the freshness of their breath. We’ve heard promising reports, too, from people whose dogs are battling some tricky healthy conditions, so we’re entirely confident that this is something which is highly beneficial to pets. The high levels of long chain EPA make this a winning supplement for joint health, and many people with aging dogs have noted heartening results. With the poor quality of many commercial foods and lack of exercise, many people find their dogs have heart issues of various sorts. Again, phytoplankton is a brilliant addition here, offering easily absorbable micronutrients which, combined with the power of EPA, appear to strengthen cardiovascular function within a matter of days. Phytoplankton has a superb effect on eyesight, sharpening and clarifying vision, especially in cases where vision is being effected by an overburdened liver. We have to be careful about making any claims for the ability of phytoplankton to help dogs with cancer. All we can say is that we have heard that people have found the powder has been highly beneficial as a supporting element in their dog’s health journey. It is highly absorbable in a way which crosses the blood brain barrier. It contains more superoxide dismutase (SOD) than any other supplement, and since this is a primary antioxidant which is generally killed by stomach acid, this makes it ground breaking. SOD has already been used successfully for soft tissue inflammation in both canine and equine veterinary situations so there’s mounting evidence that it has beneficial properties. The high bioavailable oil and nutrients in phytoplankton make it a superb addition to any dietary regime for your dog, and we’re confident you’ll notice a real shine to their coats soon after doing this. More and more pet owners are reporting that marine phytoplankton has really helped their dog’s canine diabetes. In fact this is one of the fastest growing areas of the business, since this is a notoriously difficult condition to treat without pharmaceuticals. It may be doing this because of its general immune boosting properties, because it helps detoxify the pancreas, or because the phytoplankton has blood-sugar balancing properties. In both Type 1 and Type 2 diabetes there is evidence of liver inflammation and here plankton really shines. With its powerful anti-oxidant and anti-inflammatory properties, plankton helps takes dogs back to a state of balanced health, offering broad spectrum minerals, and helping restore normal glucose levels of over time. There’s lot of evidence that essential fatty acids play a role in alleviating diabetes too so, in our view, plankton should be a part of any canine health regime. Please write and tell us of your experiences with this! Perhaps because of it’s immune-modulating effects, plankton seems to aid dogs facing allergic reactions in boosting overall heath, reducing inflammation and restoring the system to integrity and wellness. With its abundance of completely pure, long chain EPA fatty acids, we are confident that marine phytoplankton represents the purest, most powerful source of EFA’s for dogs. Put a spoonful of this into your dogs food bowl and watch their health soar. One of the most common reasons we’re contacted about canine uses regards cancer. The web is full of extremely strong claims about how phytoplankton can help with cancer cancer, with little scientific evidence backing this up as yet. Our suggestion is that you simply try it and see how it works for you pet – it’ll certainly offer a broad spectrum vitamin and mineral which can be easily absorbed, as well as a powerful energy booster. There is evidence to suggest the antioxidants in phytoplankton are powerfully anti-carcinogenic – hopefully as more studies are conducted we’ll be able to publish some of them here. Packed with superoxide dismutase, minerals, vitamins, carotenoids and EFA’s, this green powder offers phenomenal broad spectrum immune system benefits. How much Marine Phytoplankton to Give your Dog? Some people have expressed concerns that this phytoplankton might in some way, be detracting from wild phytoplankton stocks and impacting other organisms. Rest assured, this is produced in a closed loop bioreactor in 100% ecologically sustainable conditions. Can dogs take marine photoplankton for humans? Since this is a question we’re often asked, we thought we’d address it directly. In case this article didn’t make that clear already, you can certainly feed any plankton supplement you might be taking for your own health journey to your canine. In fact, many of our customers simply give their dog some at the same time they take their own daily dose.